Working in the automotive industry will inevitably expose technicians to substances like oil and grease on a daily basis. In many cases, these substances can actually present a safety hazard. PMM finds out why it is good practice to wear gloves at work. weakness in the affected areas and even paralysis. In addition, if the fluids come in contact with workers’ eyes, for example, by rubbing their contaminated hands on their face, eye irritation and redness can occur. To counter these risks, many mechanics are now protecting their hands by wearing gloves. This provides a barrier between their hands and the many fluids and greases they come into contact with while working on vehicles. While the benefits of wearing gloves in the automotive industry are clear, there is some debate regarding which glove material is best, especially when choosing between latex and nitrile. Mechanics wanting a tough and durable disposable glove that still allows dexterity for precise tasks need look no further than the Black Mamba nitrile disposable glove, argues Fortress Distribution. These distinct, all black gloves meet the demands of automotive and industrial users with the added benefit that the colour helps to hide dirt, grime and grease to increase overall product lifetime and value. Black Mamba gloves offer a secure and tactile grip, whilst providing sensitivity for delicate, precise tasks as required by automotive technicians. At over 6.0mil thick, the Black Mamba nitrile gloves offer a superior fit and better puncture and tear resistance than standard latex disposable gloves. The Black Mamba Torque Grip is a powder-free nitrile disposable glove designed with Torque Grip patterning over the entire hand area to help with surface performance and allow firm grip at all times. painting and many other routine automotive tasks. If the application requires a technician to use a latex glove, such as jobs that require protection against ketones, including MEK and acetone, then ‘low protein, powder-free’ latex gloves should be specified. These chemicals are often used in solvent thinners and degreasers in automotive applications such as body shops. 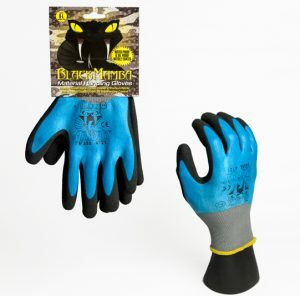 Here, heavy duty latex gloves such as the 14mil thick Pro Blu Mamba should be the preferred choice. As well as chemicals, other hazards are also present in the workshop – for example, a risk of impact, abrasion, cuts, puncture or high temperature. For these mechanical hazards, a more robust glove may be required. 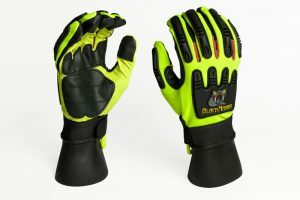 The Black Mamba heavy duty impact gloves offer back of hand safety. The glove has been carefully designed to meet customer needs by enabling full back of hand protection whilst still allowing comfort and dexterity. Offering defence against abrasion, impact and hand fatigue, the glove is made from a polyester liner with thermal protective rubber padding on the fingers and back of hand. For further information from Fortress Distribution, click here. Previous : Cybercrime: A Real Threat to Your Business?